Here you'll find my contemporary classical music for many instrumental and vocal combinations. Browse my Sheet Music Catalog, which is one way to peruse the Spindrift store. Check out the Listen pages, or find listening links for specific titles in the store. Check out my projects. If you don't find something for your instrument, contact me so we can collaborate on something new. Do you wish you could improvise? Practice free-style improvisation when you practice your instrument. It's fun & musically rewarding! Free email lessons in your inbox. Read more about improv in my Elusive Music blog: "Free-Style Improv Basics"
Watch the LexMedia Video. Search for "Martin Luther King" in onDemand. 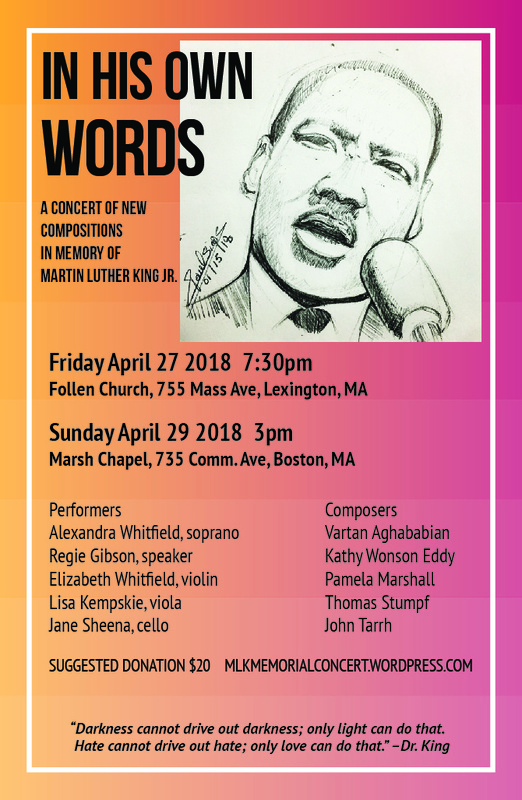 Contact the performers about bringing "In His Own Words" to your community.